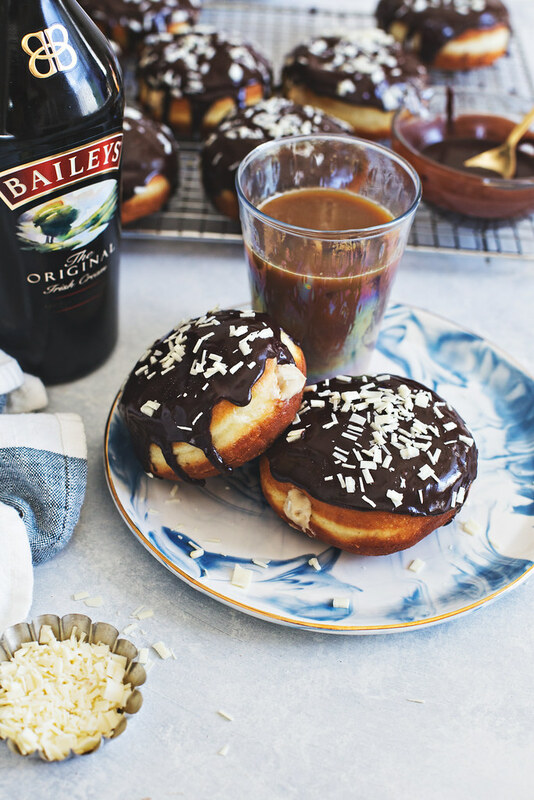 Baileys Coffee Custard Doughnuts!!! It is no secret that I am a lover of doughnuts, in fact, I have a doughnut friendship tattoo (with this lady!) on my body. These Baileys-spiked pillows are made using my favorite Hokkaido Milk Bread inspired dough. This recipe begins with a roux that creates the most magical, plush and feathery dough with just enough chew to let you know it’s a yeast risen. I like to allow the dough to rise overnight–the flavor of the finished dough has more depth from the slow rise and the chilled dough is much easier to handle. 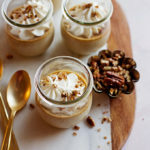 The coffee custard is spiked with Baileys Original Irish Cream and lightened with a little bit of whipped cream for a mousse-like custard. 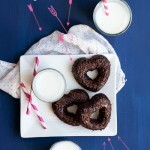 The classic chocolate glaze is also spiked with Baileys to lend just another layer of that distinctive Irish cream flavor. 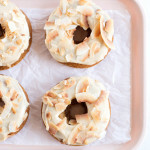 Make these and invite friends or you may find yourself eating half a dozen on your own. 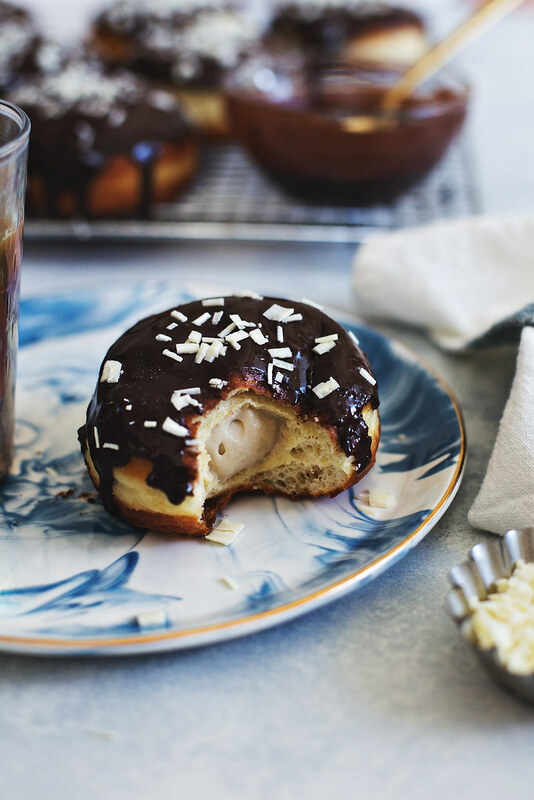 A pillowy overnight dough is filled with creamy Baileys-spiked coffee custard and glazed with chocolate. Start the dough by making the roux, whisk 2 tablespoons of flour with ⅓ cup of water in a small saucepan, making sure to whisk out all the lumps. Place the saucepan over medium heat, stirring constantly, until the mixture thickens into a paste. Remove from the heat and set aside. In a measuring glass, heat the milk in the microwave until just warm to the touch (about 30 seconds). Whisk in the sugar and yeast. Set aside for about 5 minutes, until foamy. Whisk in the eggs, and melted butter. Add the flour and salt to the bowl of a stand mixer, fitted with the dough hook. Add the roux and yeast mixtures to the flour and begin mixing on medium speed. Once the dough comes together and there are no longer any dry bits, continue mixing for 10 minutes to knead the dough until you a tacky, stretchy dough (you can also do this by hand, it will take a bit longer). The dough will be fairly sticky and wet, that's totally fine! Turn out the dough onto a clean, flour-dusted surface, and knead a few times by hand until you a smooth ball of dough. Place the dough into a greased bowl and cover with plastic wrap. Rest the dough in the refrigerator overnight (or on the counter at room temp until doubled in size, about 1 hour). Once the dough has doubled, pat it out on a flour-dusted surface to about ½-inch thickness. Using a round cutter (I used a 3-inch cutter), punch out the donuts. Gather the scraps and knead into a disk, cover and allow to rest 15-30 minutes before patting out and cutting more donuts. Place the donuts on a parchment lined baking sheet that has been dusted with flour, very lightly dust the tops of the donuts with more flour and cover. Let the donuts rest at room temperature until doubled in size. If the dough has been chilled overnight this may take anywhere from 30 minutes to 1½ hours. Fill a deep saucepan about ½ full with canola oil, fit on a candy or frying thermometer, and heat to between 325 and 350°F. Fry the donuts in batches, about 2 minutes per side, until deeply golden. Set the fried donuts on a baking sheet fitted with a wire rack over the top. Let the donuts cool before filling. To fill the donuts I used a chopstick to poke a hole in one side and sort of wiggled out a cavity in the center of each donut before piping in the filling with a medium-sized round piping tip. 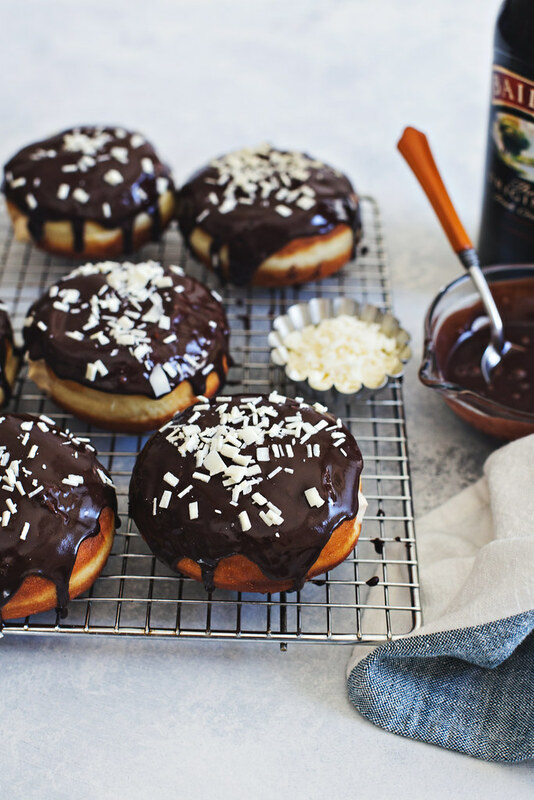 Fill each doughnut with the custard mixture and dip into the glaze. Decorate with white chocolate shavings. In a medium saucepan whisk the sugar, salt, and cornstarch into the egg yolks, adding a splash of milk if it's too thick until the yolks are broken up and become a paler yellow. Whisk in the milk, cream, and Baileys. Whisk the mixture over medium heat until thickened enough to coat the back of a spoon (when you run a finger through the pudding on the spoon there should be a clear track that does not come back together). Remove from the heat and whisk in the butter and vanilla. Cover with plastic directly on the surface and chill. While the custard chills, whip the remaining ½ cup of cream to medium peaks. 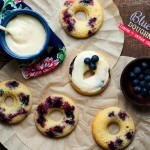 Fold the whipped cream into the chilled custard, cover with plastic, and refrigerate until ready to fill the doughnuts. Melt the chocolate in the microwave in 30-second intervals, stirring between each until the chocolate is smooth. Sift the cocoa and confectioners sugar together and whisk into the chocolate mixture along with the milk and Baileys. If the glaze is too thick add more milk, a teaspoon at a time until you achieve the consistency you like.